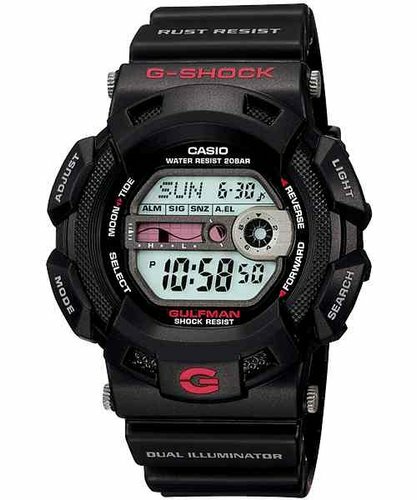 From G-SHOCK, the watch that delivers the ultimate in modern personal timekeeping, comes a GULFMAN model that packs powerful features and functions into a tough rust-resistant configuration. All external metal parts, including screws, back cover, buckle, and even button shafts are made of titanium alloy for total protection, even in seawater environments. Built specially for seafaring use, Gulfman employs titanium construction for all metal parts that come into contact with air, from the bis, case back and buckle to the button shafts. A titanium bis has also been adopted for the band attachment to provide rust-resistant countermeasures down to the smallest detail.